17. Jahrhundert, Deutsche Eichenkommode/Truhe mit Eisenbeschlägen "Stollentruhe"
The large rectangular standing chest with full-height stiles, extensively mounted with wrought ironwork straps with quatrefoil finials which 'wrap' around the chest edges. These are fixed with convex head nails: running vertically up the front six straps; running around both sides, three C-shape horizontal straps; running from the back to the front of the lid nine long straps. The ironwork with some remains of the original tinned surface. 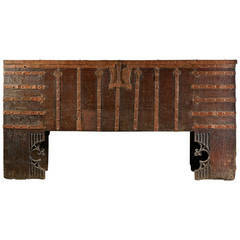 On the chest front, centrally placed, is a large, quatrefoil iron lockplate with four corner trefoil finials and two more superimposed trefoil finials, which receives a corresponding external hasp fitted to the lid. 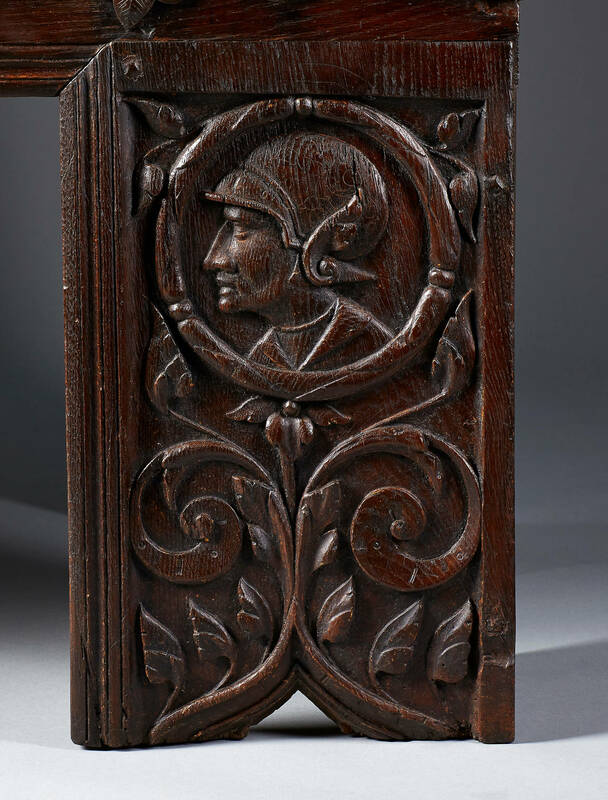 Below the floor of the chest, the two front legs are finely carved on the front face, in low relief with a rectangular 'panel' depicting on the left a man’s bust in profile, within a laurel wreath surrounded by leafy stems; on the right a woman’s bust. Both man and woman are dressed in early 16th century style, the bearded man is wearing a hat with a large feather, the woman a typical cap and a necklace. The lid is very heavy and is supported on three substantial iron strap hinges that extend right down the back of the chest. Inside the chest at the left end is a shallow, oak till with lid. The inside is later painted in red. Historical context note This type of large rectangular standing chest in oak, elaborately mounted with long ironwork straps, is known as a 'stollentruhe' (from its construction using thick boards 'stollen') and was made from at least 1170 (dated by dendrochronology), and continued to be made into the 17th century. Distinctive features include: the vertical ends (as opposed to slanted ends held by rails); the 'clamp-front' method of construction, by which a large front board is jointed into full-height stiles using a single, long tenon; a lid with small or no overhang held on two hinges. Some make prominent use of metal bands; others incorporate carved decoration on the front legs. The type has become closely associated with northern Westphalia (in central, western Germany ). 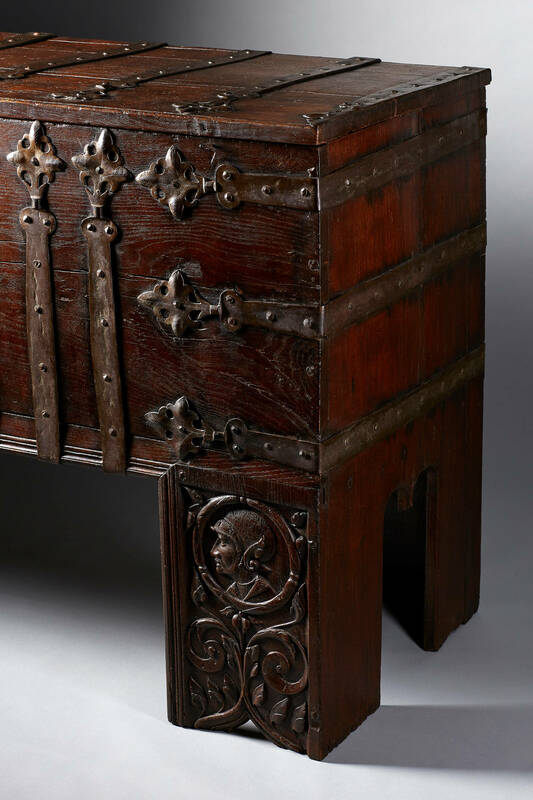 Although certain examples are fitted with carrying handles (and although all chests are portable to some extent), the great weight of this type of chest (approx. 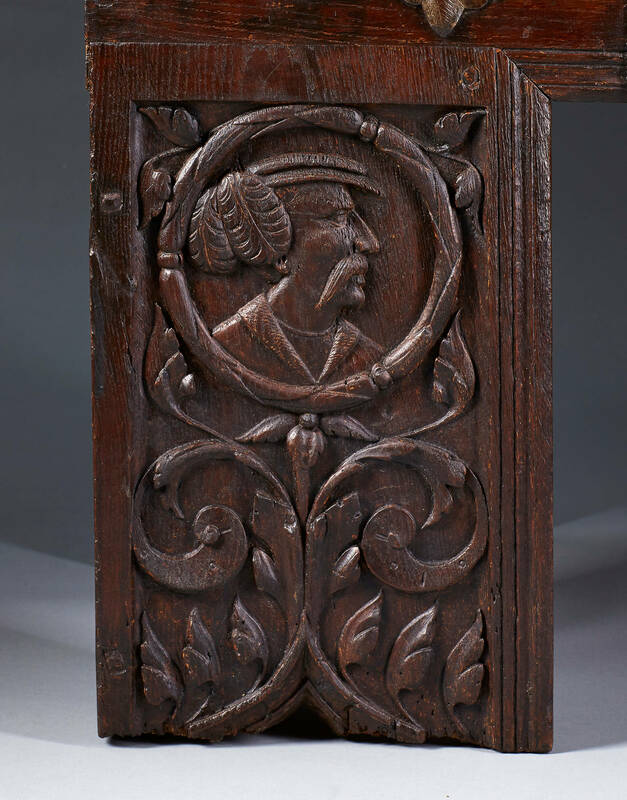 100kg empty), the plain backs and decorative carving and ironwork indicative that they were essentially static pieces of furniture - combining large storage capacity and a reasonable measure of security with conspicuous display. In addition to their impressive proportions and height off the ground (keeping the contents away from damp or dirty floors), their most showy aspect was the wrought and cut ironwork mounts. The multiple iron straps fulfil a dual role: principally decorative but also reinforcing the structural wood joints. 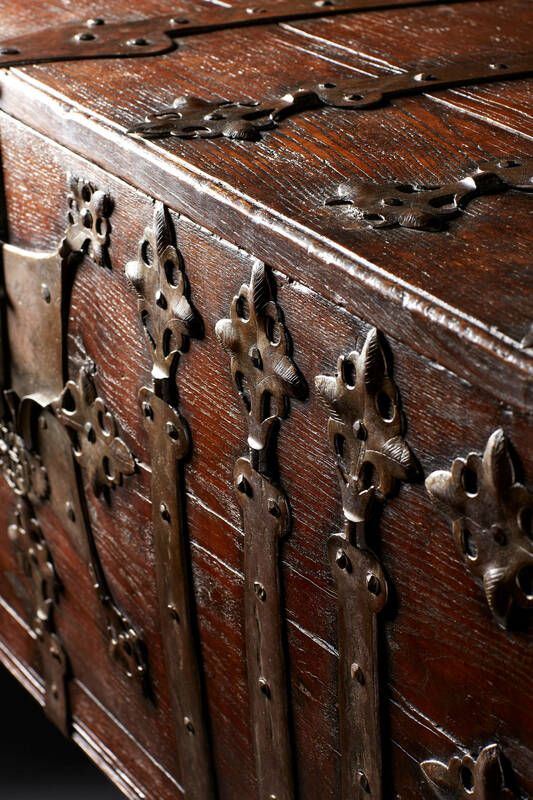 Evidently such chests were intended to be secure: the timbers and hinges (a notorious weakpoint of chests) are notably robust and some examples are fitted with additional hasps. The central lock-plates on these chests are particularly impressive but in terms of security represent the weak point of the chest. 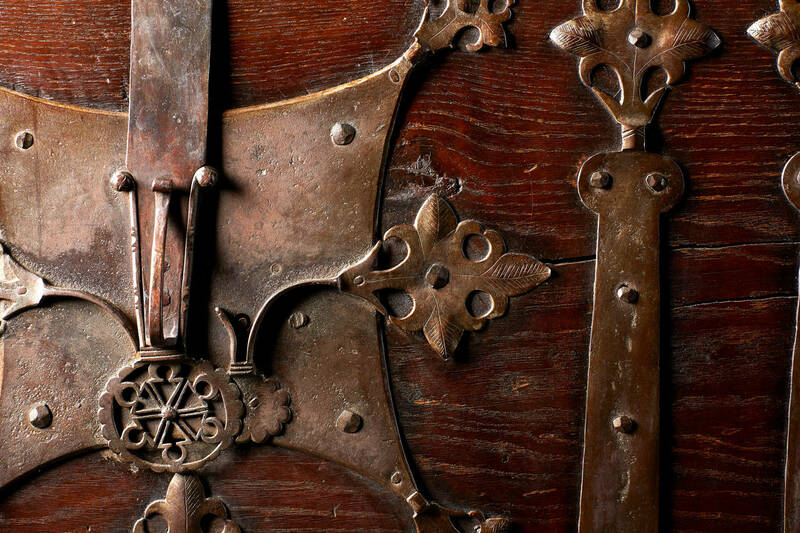 In the same way as keys were displayed as a badge of status by officers of the household and women in medieval Europe, ornate locks on doors and chests were part of a concern to draw attention to household wealth and its distribution on controlled terms. Whatever the contents of such chests, they were a way to assert the authority of the owner. 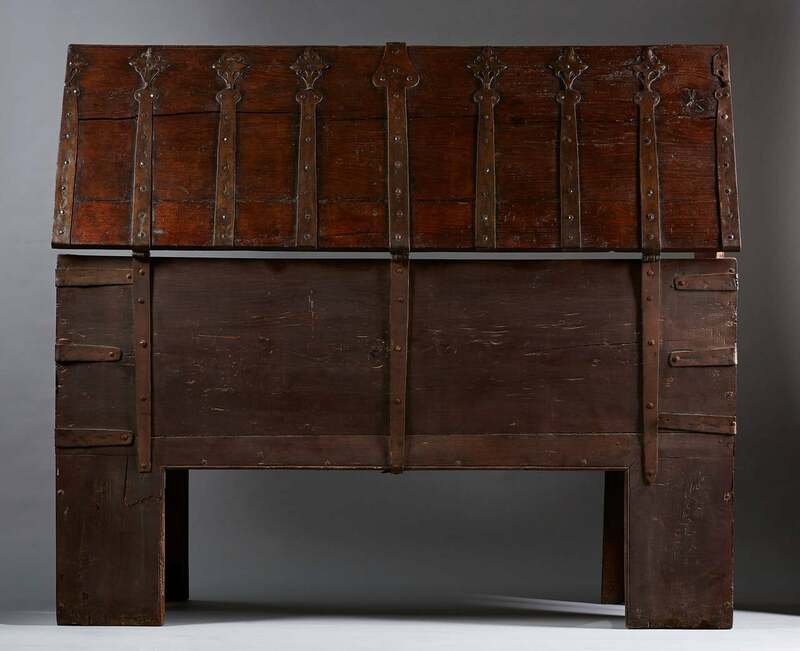 Function Chests (of all shapes and sizes) were the most common form of furniture in late medieval households. Even poor households are likely to have had at least one, while the inventories of great households can list hundreds. They were used to hold all manner of goods: coin, plate and personal jewels, clothes and textiles, vestments and chapel ornaments, muniments, books, arms and armour, lights, grain and bread. 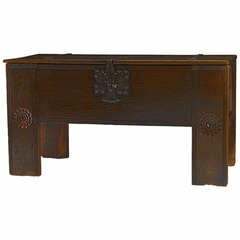 A practical disadvantage of large chests was accessing contents especially smaller objects at the bottom. 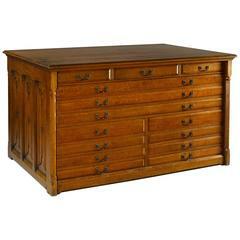 Most chests of any quality have a built-in, lidded compartment or 'till' across one or both ends. These must have been convenient for smaller valuables (and perhaps candles), and some were fitted with their own lock. Baumeier argues that 'stollentruhe'chests were commissioned by the urban bourgeoisie (for example rich merchants and farmers), especially for a new wife’s trousseau. They were used by both women and men, principally used for clothing and textiles but also containing weapons (harness and swords), documents, jewellery and money. After the death of the owner the contents (if clothing or metal objects) is sometimes recorded as remaining in the chest until the heirs come of age. They are generally fitted with a lockable container (Beilade) or till at the right or left side. 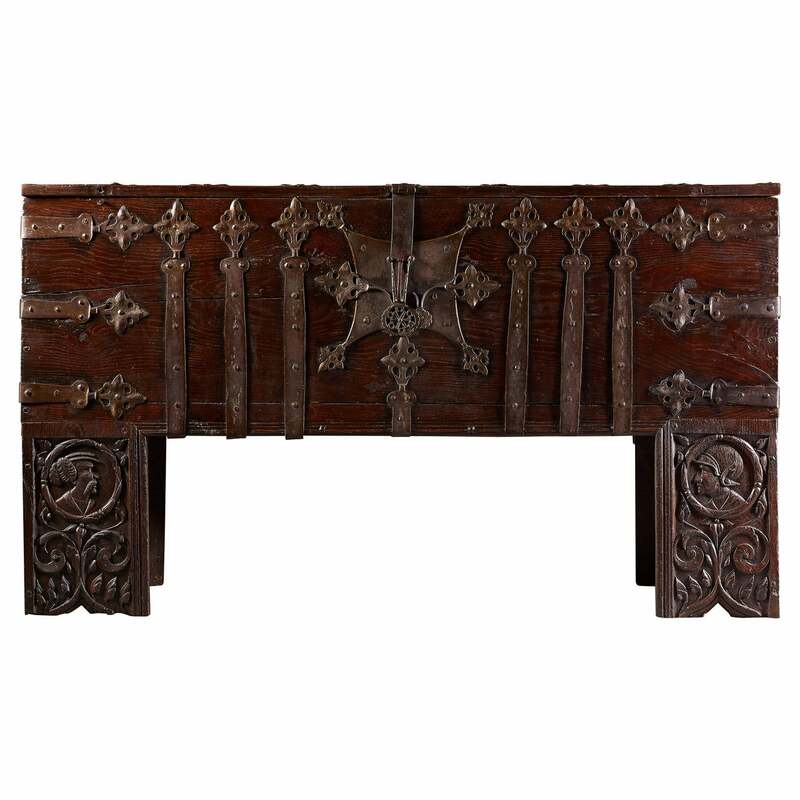 Unfortunately no contemporary image of a room with a Westphalian studded chest with iron fittings has been found. Provenance: Private collection Frankfurt a.M. Literature: Baumeier, Stefan, Beschlagene Kisten; Die a¨ltesten Truhen Westfalens, Essen, 2012. Falke, Otto von, Deutsche Mo¨bel des Mittelalters und der Renaissance, Stuttgart, 1924, plates 85, 86 and 87. Kreisel, Heinrich, Die Kunst des deutschen Mo¨bels, Von den Anfa¨ngen bis zum Hochbarock, Mu¨nchen, 1968, Vol. I, plate 45, Sammlung Kurpfa¨lzisches Museum, Heidelberg. Stu¨lpnagel, Karl Heinrich von, Die gotischen Truhen der Lu¨neburger Heideklo¨ster, Cloppenburg, 2000. Windisch-Graetz, Franz, Mo¨bel Europas, Vol. I, Von der Romanik zur Spa¨tgotik, Mu¨nchen, 1982, Abb. : 146, Sammlung Germanisches Nationalmuseum, Nu¨rnberg. Die rote Farbe des Inneren späteren Zeitpunkt (vermutlich 19. Jahrhundert), Key ersetzt. Große Kastanienbrust auf Füßen, die Löwenbeine des frühen 17. Jahrhunderts bilden und aus Platten mit stilisierten Pflanzendekorationen bestehen. Frankreich Anfang des 17. Jahrhunderts. 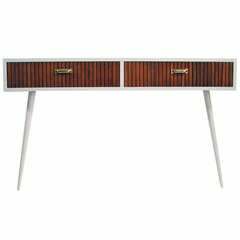 Renaissance-Sideboard mit verspiegeltem Aufbau und 2 Schubladen über 3 Türen.